The ANGER HCX turnkey systems are tailored to the client's specific needs. The system is designed with specific parts, constructed and then programmed. As a result the highly productive HCX systems can achieve very short cycle times while achieving high accuracy. These systems are designed to be highly productive for the manufacture of large volumes. 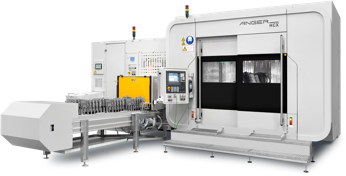 One ANGER HCX machine can, depending on the complexity of the work piece, achieve a cycle time and production quantity equivalent to two double-spindle traditional machining centers. When compared with a single-spindle traditional machining center, the HCX can replace 4 and sometimes even 8 of them.